Buy Online Now! 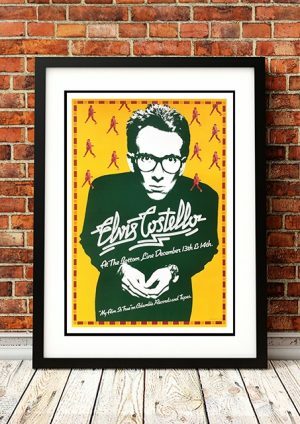 Classic Elvis Costello Concert Posters and Memorabilia. 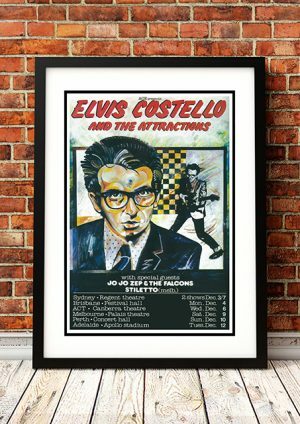 Elvis Costello exploded onto the late 1970s new wave scene as a brash singer/songwriter who reinvigorated the literate, lyrical traditions of Bob Dylan and Van Morrison and paired them with the raw energy and ferocity that were principal ethics of punk. Early in his career, Costello listed “revenge and guilt” as his primary motivations, but what really counted was the construction of his songs, which set his densely layered wordplay in an ever-expanding repertoire of styles. Since Costello’s melodic instincts were as sure as his gifts as a lyricist, his musical experiments generally drew praise, enhancing his reputation as a quintessential critics’ favorite. Rock singer David Lee Roth once remarked that critics liked the bespectacled, nerdy Costello because they all looked liked him. Granted, some members of the pop intelligentsia never forgave Costello for moving beyond the brazen minimalist urgency of his early seminal albums; but it’s just this progress that has allowed the singer to remain a relevant, respected artist. 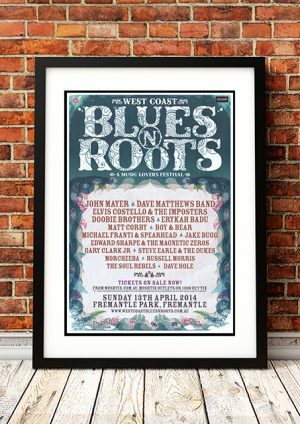 We stock an awesome Counting Crows Print.